Durgashtami or Durga Ashtami is the eighth day of nine days annual Navaratri festival in India. 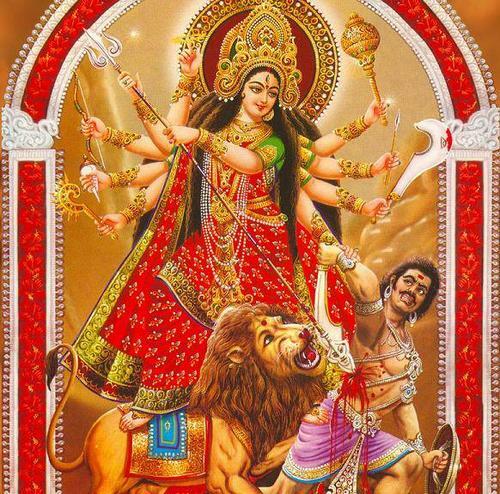 Durga Ashtami is also known as Mahashtami or Veera Ashtami. Weapons of Goddess Durga are worshipped on this day and so it is known as Astra Puja or Ayudha Pooja. The day is also known as Virashtami as there are displays using arms or martial arts. It is one of the most important days for Goddess worship in Hindu religion. Durgashtami day is celebrated as Pooja Vaipu day in Kerala. In 2016, Durga Ashtami date is on 9th October 2016. On Ashwin Krishna Ashtami day, Goddess Bhadrakali, the powerful and fierce form of Mother Goddess was incarnated. She appeared along with Yogini ganas to annihilate demon Mahishasura. In Sanskrit ‘Durga means the undefeatable’. Goddess Bhadrakali appeared with 64 Yogini Shaktis and some other fierce Goddesses to strike fear in Mahishasura. On Mahanavami, she became ‘Mahishasura Mardini’ by slaying the demon Mahishasura. Durgashtami is also known as Veerashtami because on this day Arjuna (The third of the five Pandava brothers) has taken out his Ayudha from Shami tree. The eight consorts of Goddess Durga also known as Eight Shaktis are interpreted differently in different regions of India. But all the eight goddesses are incarnations of Maa Shakti with different aims. The Ashtanayikas that are worshipped during Durga Puja are Brahmani, Maheswari, Kameswari, Vaishnavi, Varahi, Narasinghi, Indrani and Chamunda. Numerous minor deities including many attendants and guards of Durga are worshipped on the day. A fast is observed by devotees on Durga Ashtami. Both men and women observe the fast. Shakti temples conduct special pujas on the day and are visited by millions of devotees. Durgashtami day ends with Sandhi puja, which overlaps into the next day which is the Mahanavami day. On Durgashtami day, Goddess Durga is offered clothes, other items which include bangles, jewellery, dhoti, kajal, bindi and other ornaments used by married women should be offered to goddess. Everyday family members should participate in Aarti. Durga Saptasathi Path should be organized by calling Brahmins. On this day Mata should be offered Bhog. There is a custom of Garba dance in Gujarat to symbolize the divine maternal energy. This is done by worshipping a lamp placed in an earthen pot with many openings. Garba dance originated in praise of the various movements of Goddess Mahishasura Mardini who relieved the people from suffering by slaying the evil demon Mahishasur during the period of Navaratri. The stick used during the Dandiya Raas dance is representative of the weapon Khadga (sword) in the hand of the Goddess. People make different kinds of offerings and honor the goddess through ceremonies, prayers and songs. Special puja rituals are prescribed for each day. Usually a community pooja is performed where a priest performs the pooja for the entire community. Generally people attend their own community pandals for daily rituals, ceremonies, music, dances and food. In different states, different rituals are attached with puja and people follow the trend.